ABOARD THE PAPAL FLIGHT FROM BRAZIL (CNS) — With a few Vatican police standing at attention in the very back of the Alitalia plane flying him back to Rome, Pope Francis told reporters about his security even before being asked. “My security staff is very, very good and now they are letting me do a little bit more,” but they must do their jobs, which is to protect him, he said. “I am tired, but happy,” he said, explaining that the joy of the Brazilian people and the happiness of millions of young people gathered in Rio de Janeiro rubbed off on him. And that was partially because he actually had an opportunity to be up close and personal. But he also acknowledged that all that close contact made some people nervous. 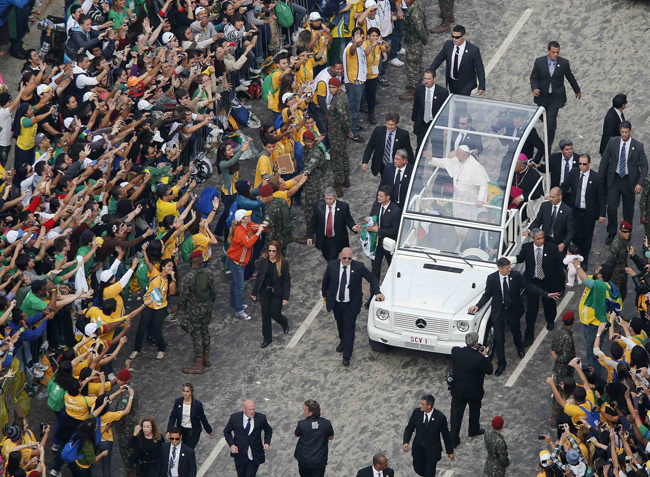 Driving into Rio de Janeiro July 22, the pope’s car was mobbed by a crowd, yet the pope insisted throughout the trip on riding in a popemobile with open sides and wading into crowds to bless or hug people and kiss babies. “Security lies in trusting people. It’s true that there’s always the danger that a crazy person will try to do something, but there’s also the Lord,” he said. Sealing off a bishop behind bullet proof glass “is also craziness,” but he said he prefers the craziness of trust. Pope Francis told reporters it is true that sometimes he feels trapped inside the Vatican; he thinks Rome is a beautiful city and would really like to be able to go for a walk.